I’ve had quite enough of the obfuscation of facts and model-based extrapolations into the future with regards to polar bears. I’m pretty sure I’m not the only one who is interested in what polar bears are doing now and, as much as can be determined, get some understanding of what the biological, geological and evolutionary history of polar bears and their habitat looks like. Spare us the emotional media hype, icon-peddling and fear-mongering about the future — we’d just like some information about the bears! 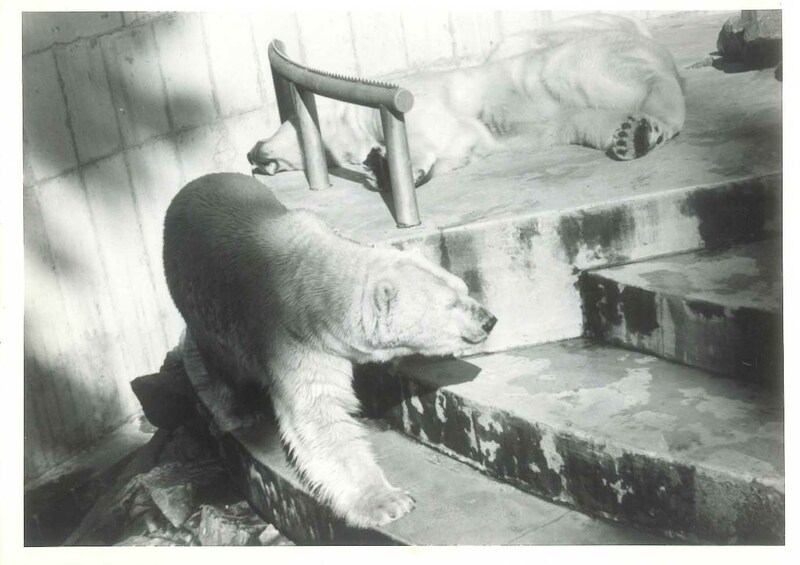 Polar bears at the Stanley Park Zoo, Vancouver, taken with my first camera in the early 1970s. Figure 5 from Stirling 2002. Note that “ovulation rate” and “natality” are measures used to assess reproductive success in ringed seals and polar bears, respectively. In effect, what it shows is that during cold, heavy ice winters (1974-74 and 1984-85), the numbers of probably-pregnant seals declined and as a consequence, overall polar bear reproduction declined. 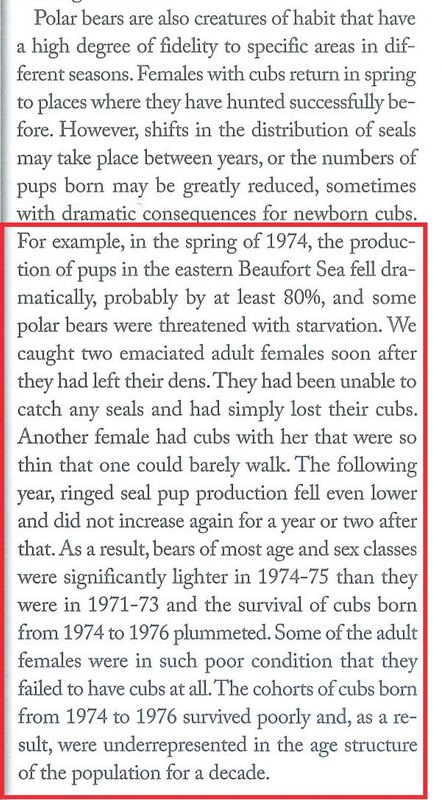 …in the spring of 1974, when ringed seals first became scarce, we captured two very thin lone adult female polar bears that had nursed very recently, from which we deduced they had already lost their litters. A third emaciated female was accompanied by two cubs which were so thin that one could barely walk. We have not seen females with cubs in this condition in the Beaufort Sea, or elsewhere in the Arctic, before or since. 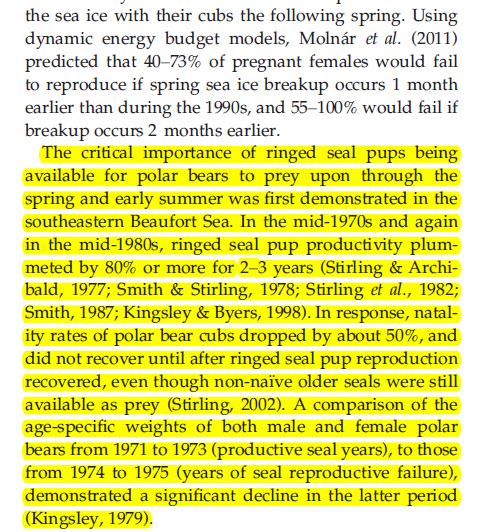 Only in 1975 were females with COY [cubs of the year] found in disproportionately high numbers in habitats normally preferred by adult males, apparently in response to the paucity of ringed seal pups in their normal pupping habitat (Stirling et al. 1993). …The environmental factors that cause periods of either high or low productivity of ringed seals in the eastern Beaufort Sea, that last for 3 or more years (Fig. 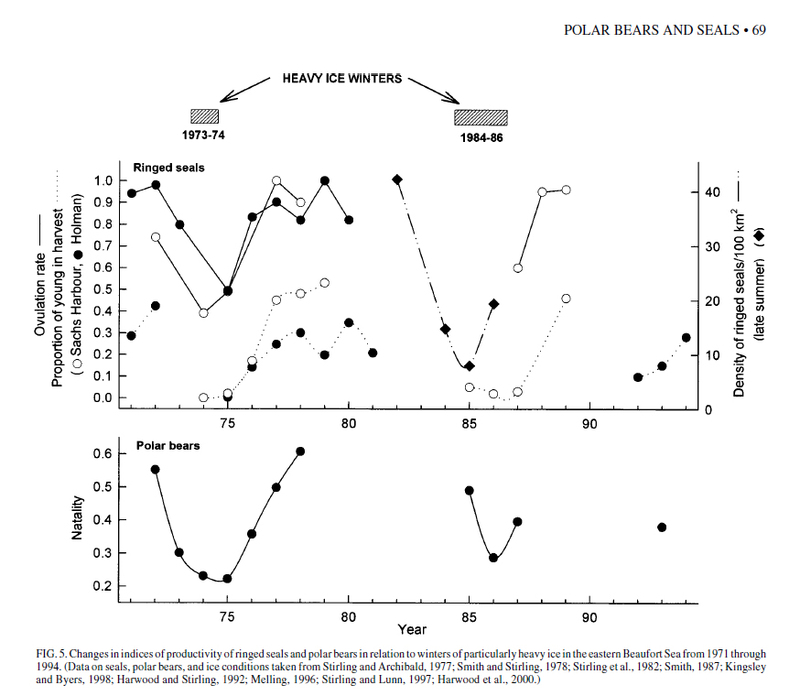 7.3), are unknown, However, particularly heavy ice in the winters of 1973-74 and 1984-85 coincided with the onset of the decline in productivity of ringed seals, and consequently polar bears, in those decades. Ringed seals are the primary source of food for polar bears in part because they are usually available close to shore in early spring. Many ringed seals choose this stable ice habitat in which to spend the winter and give birth/mate in the spring (seals mate just after the pups are weaned). Ringed seals are the only seals that establish and maintain these breathing holes in the ice throughout the winter. As a consequence, they are the only prey species easily available to polar bear females who have chosen to den on land or on the shorefast ice close to shore. Fat, newborn ringed seals are an extremely important source of calories for female polar bears emerging from hibernation in the spring with fast-growing new cubs. Of course correlation is not causation but in this case, there are good reasons for supposing that heavy shorefast ice might cause a decline in ringed seal numbers. That’s because there is likely to be a maximum sea ice thickness beyond which keeping breathing holes open becomes impossible for seals. So what do they do if the ice gets too thick? The Beaufort Sea biologists were apparently perplexed at the ‘disappearance’ of ringed seals from the shorefast ice in very cold years. However, observers in Greenland report that in cold winters, when the shorefast ice becomes very thick, the ringed seals simply move out into the pack ice (Vibe 1965:19, 1967). Such flexibility seems not to have occurred to Stirling and colleagues, perhaps because they were convinced that ringed seals do not give birth or mate in the pack ice (more on that issue in a subsequent post). Moving offshore, into the pack ice, makes nearshore seals ‘disappear’ but they are not dead — just somewhere else for a while. So what is the issue with the book and the new paper? Below is what the new Stirling and Derocher paper, entitled “Effects of climate warming on polar bears: a review of the evidence,” in the subsection Why progressively earlier breakup of the sea ice negatively affects persistence of polar bear subpopulations) says about the 1970s mortality event: you tell me if you see a mention of cold or heavy ice. Below is what Stirling says in his book about the 1970s mortality event: again, tell me if you see a mention of cold or heavy ice. If the case for progressively reduced Arctic sea ice due to “climate warming” over the last 35 years is so strong, why are these contortions of fact necessary? Stirling, I. and Derocher, A.E. 2012. Effects of climate warming on polar bears: a review of the evidence. Global Change Biology 18 (9): 2694-2706 doi:10.1111/j.1365-2486.2012.02753.x http://onlinelibrary.wiley.com/doi/10.1111/j.1365-2486.2012.02753.x/abstract Stirling, I. and Lunn, N.J. 1997. Environmental fluctuations in arctic marine ecosystems as reflected by variability in reproduction of polar bears and ringed seals. In Ecology of Arctic Environments, Woodin, S.J. and Marquiss, M. (eds), pg. 167-181. Blackwell Science, UK. Vibe, C. 1965. The polar bear in Greenland. In, Proceedings of the First International Scientific Meeting on the Polar Bear. Fairbanks, Alaska 6-10 September 1965, IUCN Polar Bear Specialist Group. University of Alaska International Conference Proceedings Series, No. 1. pg. 17-25. Washington, DC. Vibe, C. 1967. Arctic animals in relation to climatic fluctuations. Meddelelser om Grønland. 170(5). C. A. Reitzels Forlag, Copenhagen. This entry was posted in Sea ice habitat and tagged advocacy, deaths due to cold, declining sea ice, Derocher, global warming, heavy sea ice, misdirection, mortality events, polar bears, Southern Beaufort, spring ice conditions, Stirling. Bookmark the permalink.